Hong Kong Umbrella Man statue on Dec 5th. Photo by Emily Tsang The artist who only wants to be known as Milk said the sculpture was inspired by an occupier holding an umbrella over a police officer. He wanted to show with his statue that Hong Kong’s democracy movement was not confrontational. “I aspire for peace. It means that we care about everyone, even if ‘everyone’ is the police force,” he said. Hong Kong’s Undersecretary for Constitutional and Mainland Affairs Lau Kong-wah and representatives of the Federation of Students held another round of preparatory talks at the University of Hong Kong campus during the evening of October 6. Both the students and government want talks to go forward this week between the Federation of Students and Chief Secretary Carrie Lam Cheng Yuet-ngor. Both sides agree that the talks will be conducted in the open and that it will be a series of talks, not just one meeting which Lau describes as “conducted on an equal and mutually-respectful basis.” The students are seeking a substantive dialogue, not just a casual chat or a consultative session. There have been some points of division in the preparatory talks and they will meet again tomorrow to try and resolve them, with the hope this is the last preparatory meeting. One area of dispute is the venue, the students want the discussions held at a university, the government is opposing these venues. The government is also urging the national legislature’s framework should be used for the discussion; the students are pushing for a more open framework. Despite threats of forced removal, protesters continued to hold public space and the government did not take action to remove them. They opened a small space for government workers to go to work. Students believe they must hold the space in order to keep the pressure on the government for fair negotiations. 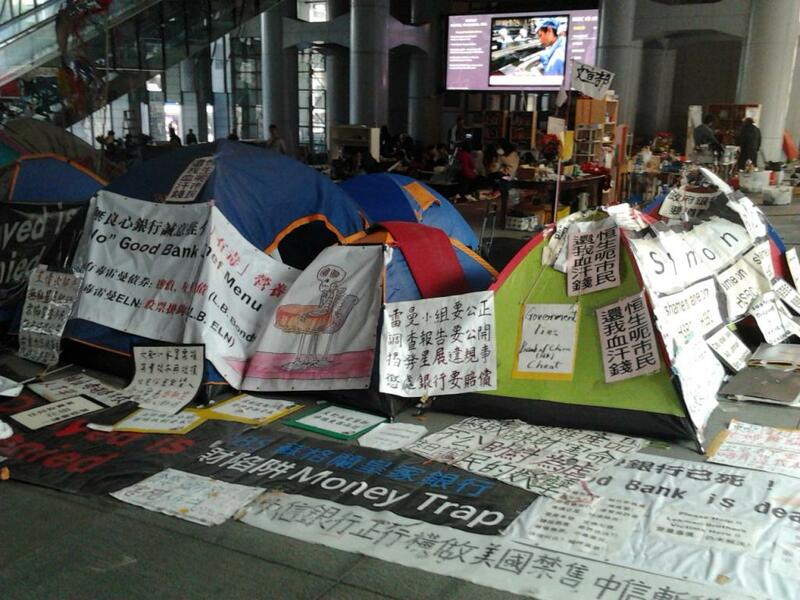 The article below describes the history and current challenges of the Hong Kong protest. Despite the politeness, short-sighted demands and bitter populism of the protests, it is at least clear that after this Hong Kong will not be the same. It was this port and the financial structure surrounding it that allowed Hong Kong to step out of its role as a manufacturer and into its role as an administrative center for global capitalism in the 1980s. As manufacturing shifted toward the port cities in China’s mainland, Hong Kong became an ideal location for the management of these new industrial hubs and a key re-export node for the Asian mainland. 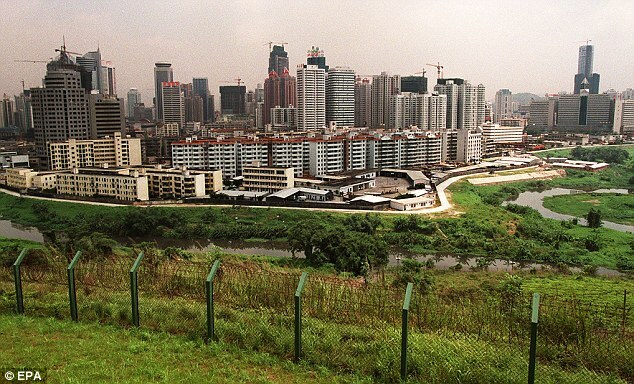 Many of the new Chinese factory zones were themselves piloted by capital from Hong Kong, Singapore and Taiwan, as well as more far-flung members of the Chinese diaspora. Asian foreign-direct investment in China today still exceeds that of the US or Europe—often in partnership with or on behalf of Japanese capital. 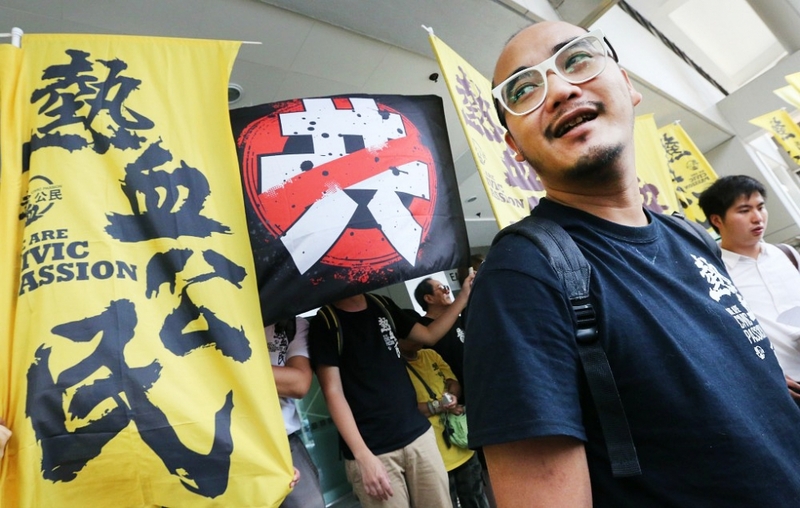 This has created a situation where Hong Kong’s young protesters are stretched between an ideologically weak but well-funded “pan democrat” liberalism and its vaguely far-right variant, loosely grouped around the 人民力量, or “People Power,” party and its followers, called 热血公民, or “Civic Passion.” Though they officially have no position on questions of immigration, Civic Passion has widely accepted far-right Hong Kong nationalists into their organization and their yellow-shirted membership can frequently be spotted at rallies telling immigrants (particularly mainland Chinese) to leave. 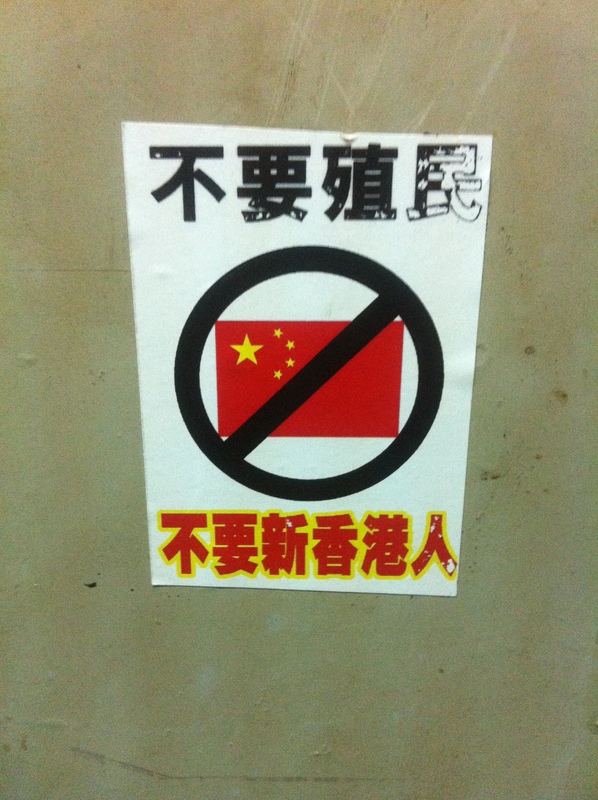 Anti-mainland sentiment is a widely accepted and very public form of racism in Hong Kong, clearly visible on the surface of everyday life. 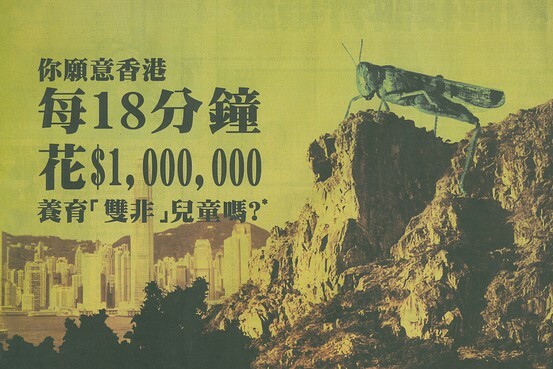 In 2012, Apple Daily, one of the few media outlets without direct or indirect censorship from Beijing, ran a full-page ad that portrayed a giant locust looming over Hong Kong, asking: “Are you willing for Hong Kong to spend one million Hong Kong Dollars every eighteen minutes to raise the children born to mainland parents?” Then, earlier this year, over 100 people joined an “anti-locust” campaign, marching to Canton Road—a site of many expensive jewelry shops favored by wealthier mainland tourists—with signs that said things like “go back to China” and “reclaim Hong Kong,” yelling abuse at any mandarin-speaking bystanders. In moments of exacerbated social tension, this everyday racism is a convenient pressure-release, structured such that it both divides the protesters and prevents them from looking across the border to find their natural allies in the rioting migrant laborers of the Pearl River Delta. 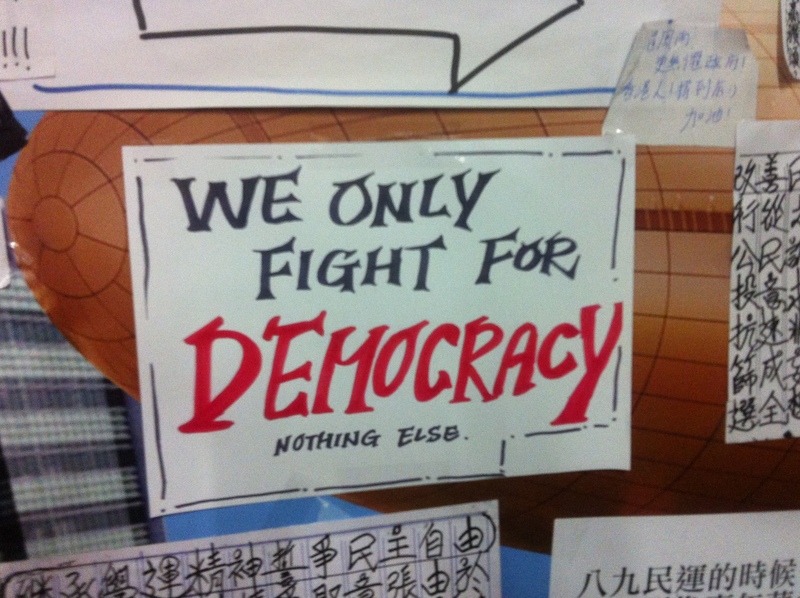 But after the new Occupy Central group held an online vote (in which only one tenth of the Hong Kong population ultimately participated), anti-Occupy forces sponsored a city-wide petition and signature-gathering campaign and public opinion polls found that there was not majority support for the re-occupation. In response, Benny Tai declared that the movement had “failed,” fearing that an actual occupation would drive more and more of the so-called “pragmatic” citizens into an outright rejection of the pan-democrats’ program. 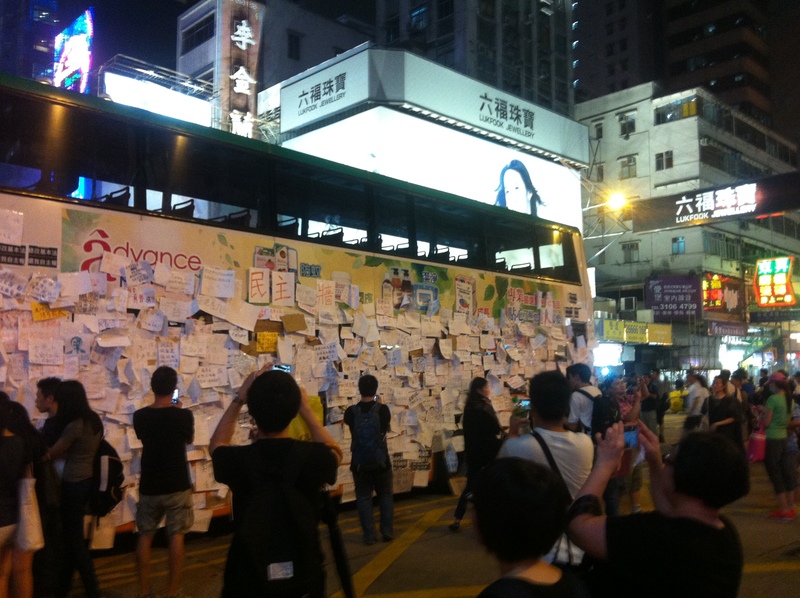 Around this time, it was common to see ads broadcast on the public buses, in which everyone from young Hong Kong hipsters to old business-owners explained that the plan to occupy Central would shut down small businesses and ruin weekend shopping. This fear that a protest movement might lose the support of civil society is a constant anxiety in Hong Kong politics, effectively forcing most movements to stifle themselves before they even begin, all in the name of politeness. Though initiated independently by crane operators within the port, the strike was quickly picked up by the Union of Hong Kong Dockers, which is affiliated with the Hong Kong Confederation of Trade Unions and the Labour Party, all led by the old guard of pan-democrats. With union representatives spearheading negotiations, the initial energies of the striking workers were quickly diverted and the strike was prevented from spreading to a majority of the workforce. The port, owned by Li Ka-shing’s flagship company, Hutchinson Whampoa, is central to both the image and economy of Hong Kong. A true shutdown would have resounded through the entire region’s economy, drying up the profit flows for many of the area’s richest capitalists in both Hong Kong and the mainland. Realizing that such a shutdown would mobilize the media—and the wealthy people who compose “civil society”—against the workers, the union and labor party convinced the strikers to accept the court injunction banning them from the port only days after the strike began. When later asked how they felt about the strike, which many media outlets portrayed as unprecedented, many of the older workers pointed out that two earlier strikes had actually occurred at the port prior to the 1997 handover, when the Labour Party was non-existent and most labor unions were illegal. These older workers argued that the earlier strikes were actually far more successful, since the workers had no union or party representation pushing them to appeal first and foremost to the tastes of civil society. They had therefore simply engaged in wildcat strikes that crippled the actual functioning of the port and thereby won them significant portions of their demands. By comparison, the most recent strike was a dismal loss. The port strike is an important precedent for understanding the “Umbrella Movement,” since today’s occupiers will doubtlessly be faced with the same dilemma. Just like the strikers, they risk becoming deadlocked between appealing to civil society and deepening their economic obstruction. Already, internal divides within the movement make this apparent. Most of the younger protesters have completely rejected the leadership of “Occupy Central with Love and Peace” group, lambasting Chan Kin-man when he claimed that the blockades would end if Chief Executive CY Leung stepped down. Meanwhile, these same young people have parroted popular language about democracy, universal suffrage and non-violence—demanding that no property be harmed and that people not fight back even if the police attack. This servile spirit of “politeness” risks stranding the protesters in a dead zone. In this dead zone, they’ll find themselves incapable of escalating the economic disruption that gives power to the movement—since many see even damaging private property as uncivil—and this inaction will make it easy enough for the government to starve out or appease the protesters with more minor concessions, such as the firing of the Chief Executive. Many, though aware of this conundrum, are equally fearful that (rumor has it) gangster provocateurs might escalate the situation on orders from Beijing, creating a convenient excuse for a military occupation of the island. An interesting contradiction arises here. The latent nationalism of the protests makes it so that the police, as “Hong Kong people,” are seen as allies and potentially future participants, while the intervention of the military—even if it used all the same tactics as the police—would be universally rejected. This is because the military units themselves would be composed of mainlanders under the direct order of Beijing, rather than the secondary control of Beijing’s Hong Kong politicians. 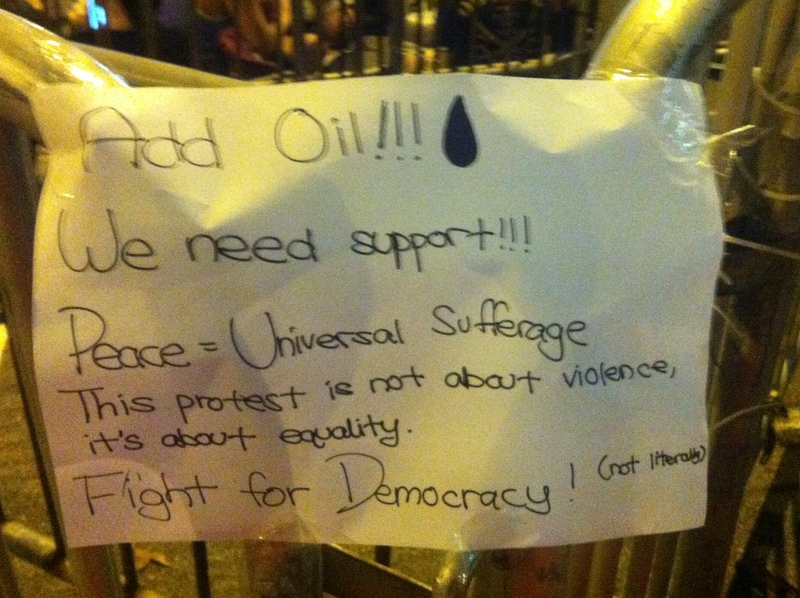 For the protesters, this does not represent any sort of logical contradiction. Many firmly hold to the position that it is counterproductive to fight police or resist arrest, then, in the next sentence, argue that people would be fully justified in using violent tactics to resist the military. A populist perspective prevents the recognition of any antagonism internal to “the people,” transposing the source of all conflict outward onto external groups, whether defined by race, national origin or simply immigration status. When such populism is predominant, riots, property destruction and even “impoliteness” on the part of protesters will be invariably written off as the work of “outsiders”—in this case, mainland Chinese—at least until they generalize. But strikes have a much greater propensity to break such a populist logic, since they immediately make visible antagonisms internal to the given society. 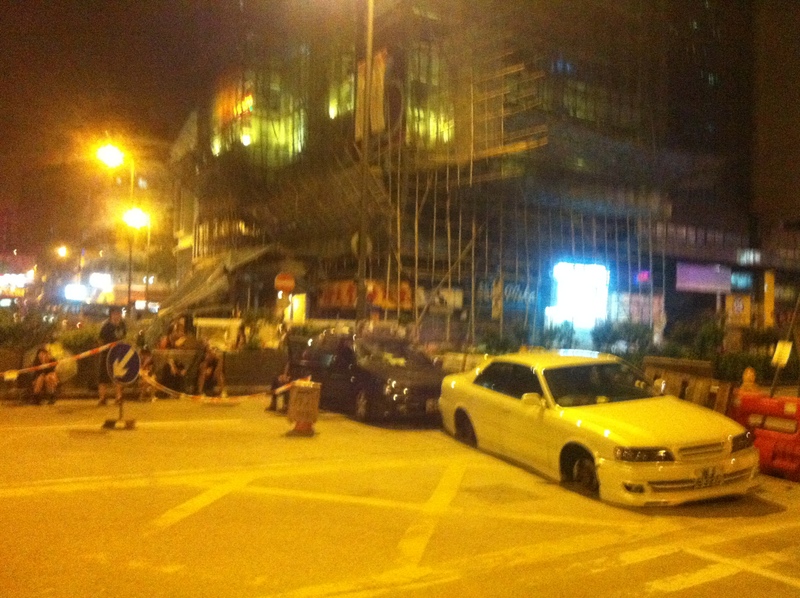 Another barricade in Mong Kok, this time with two cars parked in front to ensure that police cannot easily break through. One car has had its tires removed in order to prevent it from being easily pushed away, added in the wee hours of October 3. 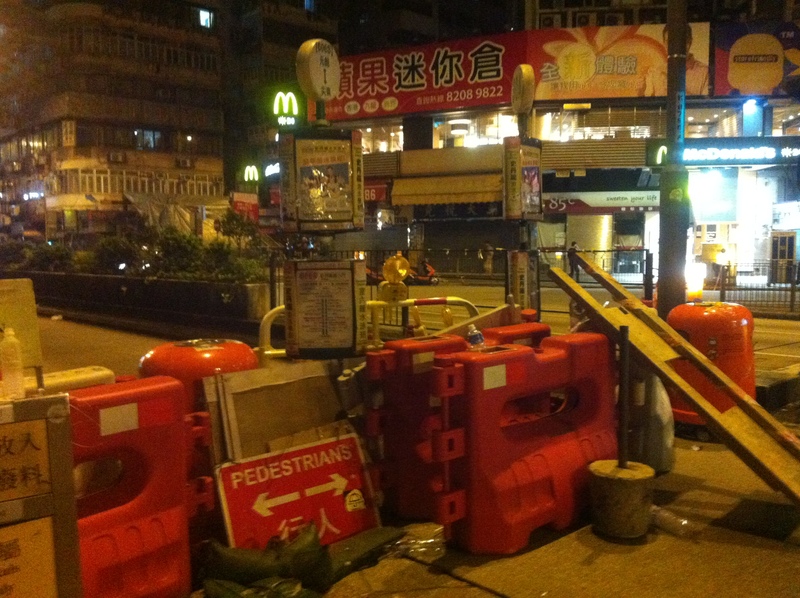 Until then, the occupiers had opened this barricade whenever ambulances and firetrucks needed to pass through. This was added after police in Admiralty had used the opportunity of an ambulance-opening to themselves drive into the occupation with with rubber bullets and tear gas on October 2. The current movement has only a few paths forward, and many routes to defeat. The tactical stagnation of the protests could allow the government to simply wait them out, as the protesters’ own inaction delegitimizes them in the eyes of more casual participants. There are already complaints from people who have newly joined the protests that the entire movement seems to be simply drifting, with no real force leading it forward. At best, the revolt may fail by becoming a “social movement”—a sterile spectacle put on for civil society, where future NGO leaders and politicians gestate before being unleashed upon the poor. 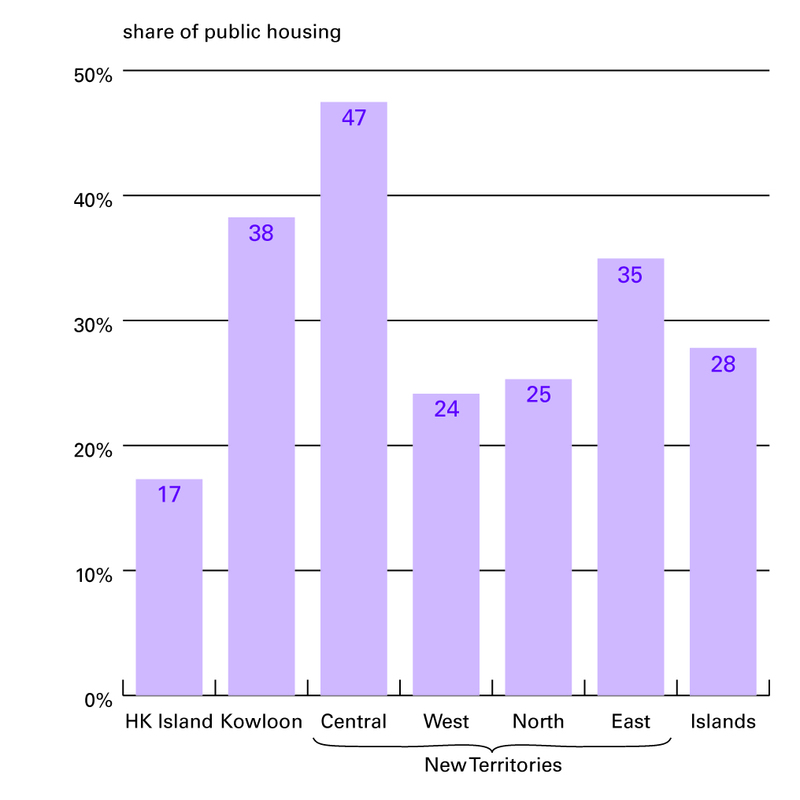 At worst, the people of Hong Kong might actually get the popular vote, in which case they’d be allowed an enormous amount of participation in a system over which they have no control and in which all the same problems of inflation, inequality and immiseration would continue unabated. In this situation, however, there is also the risk that defeat might come in the form of a resurgent rightwing. If the far-right is capable of becoming the force that can torque the protests out of their stagnation, then the movement as a whole will slide farther down the path of nationalism. In the current “era of riots,” the right-wing tends to be capable of magnetizing people to itself regardless of whether the majority of people agree or disagree with the racist politics of groups like Civic Passion—which went normcore early on in the movement, abandoning its public presence in favor of an “undercover” agitation, spreading flyers and speeches attacking the inaction of the “leftist pricks” in charge, and only more recently has become a visible presence, their yellow-shirted members defending the barricades in Mong Kok (barricades built by anarchists, no less) against attempts to dismantle them by “blue ribbons” (civilian opponents of the movement allegedly organized by Beijing). This situation bears a miserable similarity to the experience of Ukraine, with the far-right acting as hatchet men for an alliance of more West-leaning capitalists. A small group of Civic Passion members reinforcing a barricade in Mong Kok after “blue ribbons” attempted to dismantle it on October 2. The police were called to mediate in the dispute between the dismantlers and the defenders of the occupation — in this case mainly Civic Passion members. Note that their shirts say, in English: “proletariat,” consistent with the general usurpation of leftist terminology by far right or “third positionist” groups. But defeat is by no means inevitable here. Young people in Hong Kong, like pretty much anywhere these days, are recognizing that their future has been looted and are attempting, through whatever means they have available, to both reach some understanding of how they have come to be in this position and how they might fight back. In Hong Kong, China is very much “the future,” as the small city-state is integrated more and more into its massive mainland neighbor. This means that the sense of a doomed future among youth translates into the intuition that China is also the origin of that approaching doom. There are plenty of young protesters who are frustrated with the inactivity of the movement, but feel isolated and incapable of pushing anything forward themselves. This is especially true at night, when more of the angry and dedicated young people tend to come out, but there are currently no means whereby these protesters are able to make contact with one another and coordinate their activity. More importantly, even these protesters tend to translate their discontent into the language of “democracy” and “universal suffrage,” and they fail to look across the border to find allies among the factory workers of the Pearl River Delta. But despite the fact that the pan-democrats’ terminology is the lingua franca of the movement, it’s clear that the movement itself is, for many people, hardly about liberal “democracy.” In fact, most discussions of what protesters actually want quickly jump into entirely different terrain. When asked what their goals are, many will respond with the parroted list of demands—this is incredibly consistent across social strata and different age groups. But when pressed about why they want these things, most protesters then immediately jump to economic, rather than purely political, problems. People bemoan skyrocketing rents, the inhuman levels of inequality, inflation in the price of food and public transport, and the governments’ tendency to simply ignore the vast swaths of people sitting at the bottom of society. One speaker at an open mic made the common—if simply wrong—argument: “Why is Hong Kong just a couple of rich people and so many poor people?! Because we have no democracy!” Many claim—with abysmally poor awareness of how liberal democracies actually function in places like Greece or the US—that once they are able to “choose” their own leaders these leaders will be able to fix widespread problems of inflation, poverty and financial speculation. Democracy has thereby come to designate less the practical application of a popular voting system and more a sort of elusive panacea, capable of somehow curing all social ills. 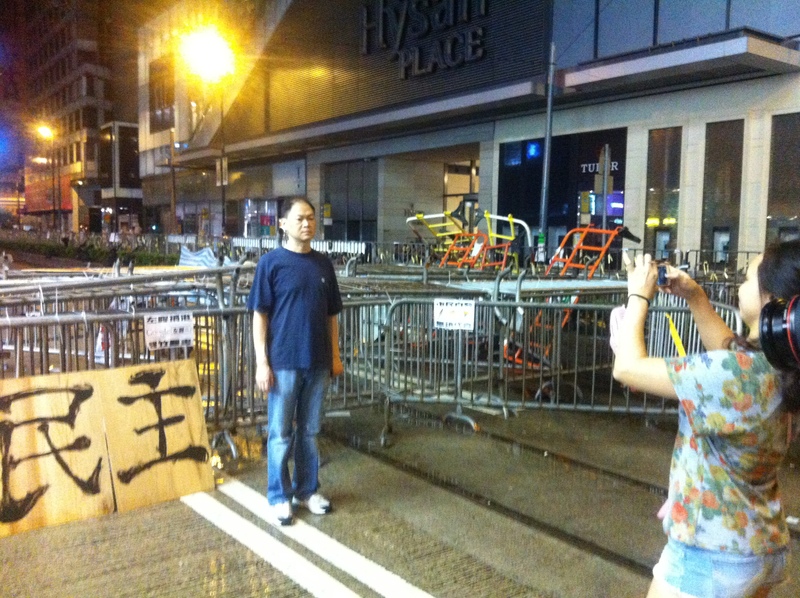 An older man (originally from Hong Kong but living abroad for several decades, returning to visit relatives) has his picture taken in front of the barricades in Causeway Bay. At his left is the word “democracy” (Behind him is another poster warning against “leftist pricks”). He disagrees with the protesters’ disruption of traffic and civil order, but thinks the police went too far in using tear gas against them, and now worries that a 1989-style bloodbath will ensue. But both the populist and democratic illusions of the movement are capable of being destabilized. As the occupation spreads to broader segments of the population, new participants bring their own demands to the barricades. 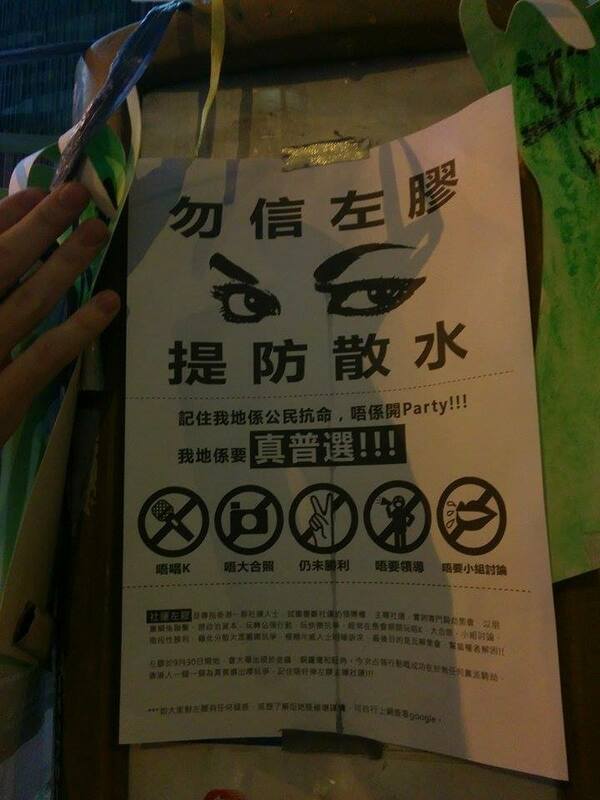 Some of the original liberal students, including the HKFS leadership, have become increasingly frustrated by this, and have been plastering up signage encouraging people to stick to demands of universal suffrage. Interviewees have expressed the fear that the movement will get “confused” and “watered down” by many of the new protesters, who have come out to protest against the police attacks on students more than they are protesting for electoral reform. But it’s just as possible that the new demands may actually re-ignite the movement itself, pushing it beyond the domain of mundane electoral demands. Generally, when class strata far distant from those that initiated the movement begin joining in, it signals a sort of phase shift in what is going on and amplifies the movement’s power, rather than watering it down. One particularly volatile potential is the increasing involvement of workers. The relatively small Hong Kong Confederation of Trade Unions has called for a general strike and, on October 1st (China’s “National Day”), at least some workers began heading the call. Several of the port workers who were involved in the initial dock strike were also present early in the week, showing their support for the protesters, though also claiming that another port strike seemed “impossible.” But as the occupation in the streets continues to grow, particularly in areas with more residential housing such as Mong Kok, it becomes more and more likely that other workers may begin to join in. This article was originally published on Ultra-Com.org.